Radios Control allows capturing one selection among a set of options. To add the radios control to your form, simply drag and drop it from the control panel to the form-design area. To adjust the properties specifically for radios, click on OPTIONS tab on the properties panel below the control. The radios control allows specifying the number of options per line. The minimum number of options per line is one (1) and the maximum number of options per line is four (4). To use this setting, click on GENERAL tab and adjust "How many options per line?" 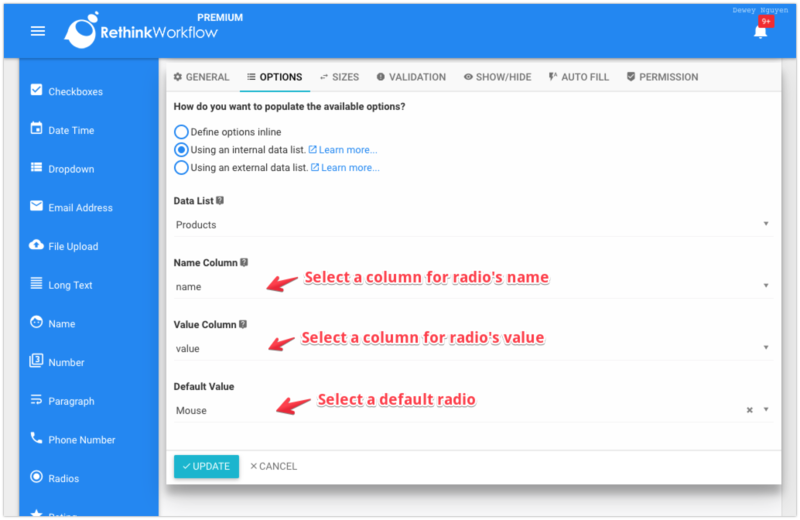 There are three ways to define the options for the end-user to select from: defined inline, using an internal data list, and using an external data list. The later two options in Advanced and Ultimate plan. The simplest way to specify the list of available options is defining it inline. 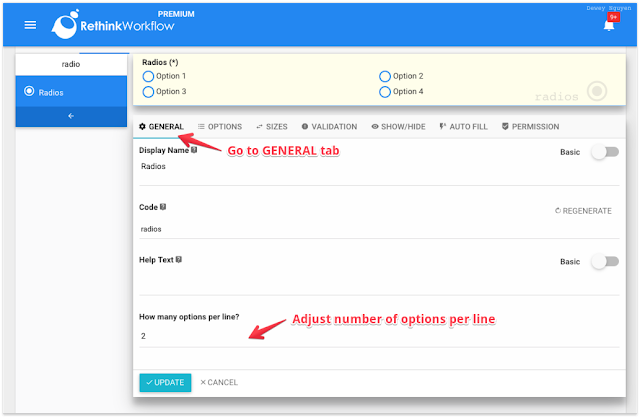 This method allows the workflow designer to manage the list of available options in the property panel. 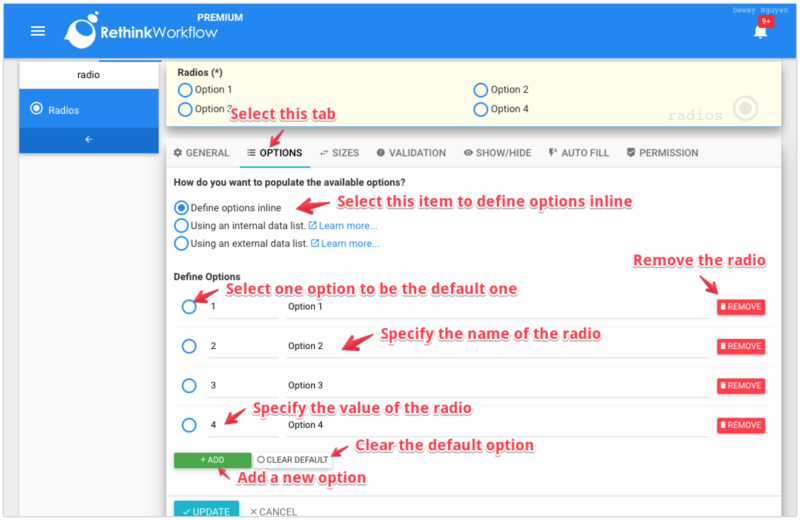 While adding options, you can specify the default value for this field by clicking on the radio at the beginning of each option. Note that only one option can be selected as the default one. 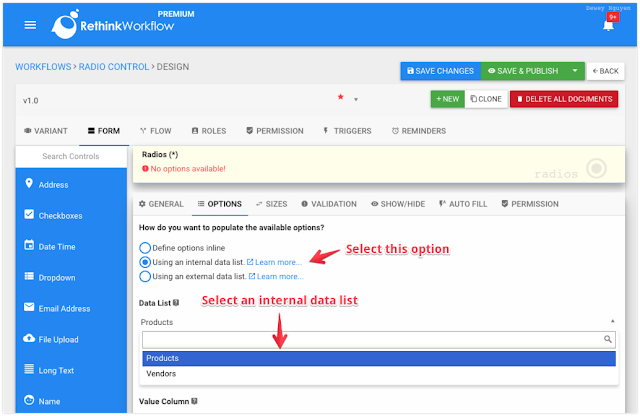 The list of available options can be managed via data list interface. TIP If there are many rows in the data list, Radios Control will display them all on the form, therefore, making the form longer. In that case, you might want to use a drop-down control instead. 1. Select "Using an internal data list." option. 1. 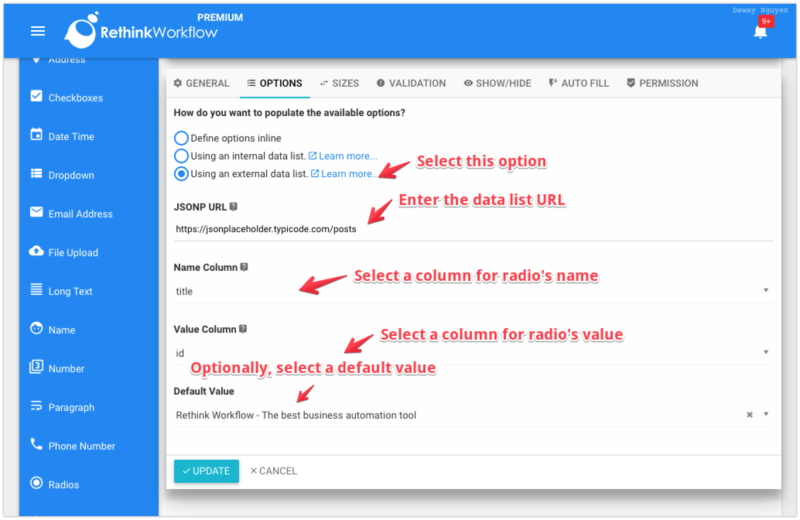 Select "Using an external data list." option. The animation below demonstrates how the end-user interact with a radios control. To filter documents using the radio field, click on FILTERS and select it from the list of filters. On the address filter popup, select the values for filtering.